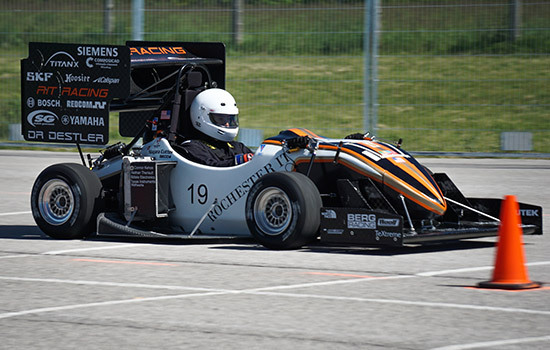 RIT Formula Racing competed in Ontario, Canada, this past weekend. Despite technical challenges and a problem with the car’s drivetrain, the team performed well in both static and dynamic categories at the event. The RIT Formula SAE Racing Team experienced elation and disappointment this past weekend at Formula North, its second event of the 2017 season. The team was ranked seventh overall in points for both the static and dynamic events during the competition. Taking the checkered flag as overall champion was a possibility until the final three laps of the endurance run. The Canadian event is held on a very demanding track surface, and a number of established teams had technical issues in endurance due to the rough track surface, said Patrick Burke, the team’s chief engineer. Adding to the disappointment in endurance, a course timing and scoring malfunction necessitated the removal of autocross points from all entrants. Teams may have scores adjusted after further review by event coordinators. In their first event, RIT Racing competed at Formula SAE Michigan, May 10-13, placing ninth overall among more than 100 collegiate teams from the U.S., Canada and around the world. RIT Formula competes as the only American university in the Formula Student East competition July 20-23. More than 115 collegiate race teams from 28 countries are expected. Information about the event can be found online.